A lot of people frown upon hybrids ….. I have no view on the subject. If evolutionary forces caused this to occur then so be it …. I am no superior being to sit in judgement on what should or should not occur. A Paithani weave is a revered object by all Maharashtrians. The gold shimmers softly and gently and does not hurt one’s eyes. The price it commands, naturally attracted other weavers of consummate skill to indulge their hands in weaving this kind of sari as well. And so, in Benaras, woven by master Benarasi weavers, the Paithani style emerged. At a wonderful wholesale store (more about the shop later) in one of the tiny but bursting-with-life gallis of Benaras, one such hybrid caught my eye and I was hooked! What exactly distinguishes a Paithani made in Paithan, Maharashtra from a Paithani style made in Benaras Uttar Pradesh? Maybe the weaving structure. Perhaps. [Needs more research]. 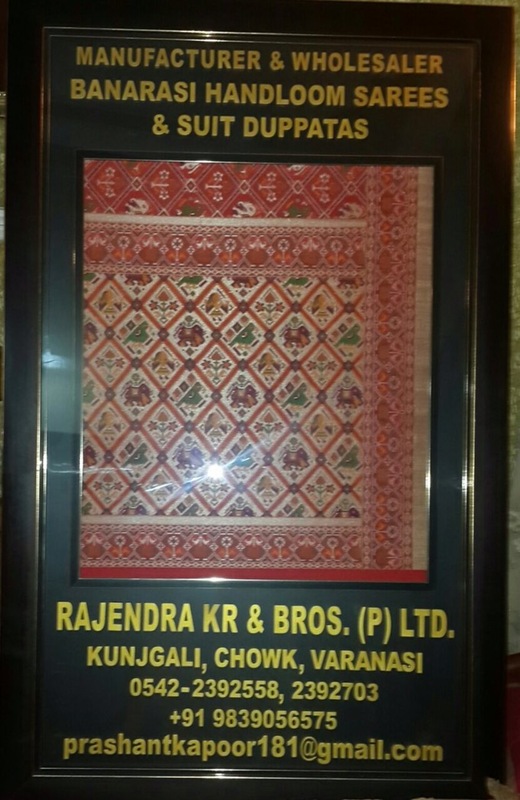 In a hundred years when this piece become an antique textile, I can imagine raging debates about whether this piece is a paithani or a banarasi – and then someone with deep knowledge of weaving will come along and reveal some secrets hidden in the structure that will make it decidedly Banarasi. Until then, many of us will wear these beauties! AND rejoice in this hybrid form that was created to exploit a market opportunity. Also handwoven by masters of their craft, these Benarasi Paithanis are unapologetically charming and offer an equally sumptuous visual feast. Here is the shop I discovered: A huge store in a little galli – where the wonderful owners spared no effort in showing me ( the prospective buyer of just a single sari while all their other wholesale customers were buying no less than a 100! ) dozens of stunning pieces over several cups of chai! A superb shopping experience!! One more reason to return to Benaras! This entry was posted on September 16, 2016 by wovensouls in Art Kaleidoscope and tagged banarasi, BANARASI SARI, benarasi, culture, ethnic art, ethnic textile, paithan, paithani, paithani sari, saree, sari, silk, textile culture, traditional art, traditional textiles, traditional weaving, weave, weaving.